In the real world, in a physical shop, the clerk listens to the customer, observes how he behaves and adapts his messages accordingly. Thanks to AI Personalization, you can now recreate this approach on your website. AI Personalization enables you to measure in real-time the conversion intent of each of your website visitors. The real-time assessment of conversion intent enables you to to target your on-site marketing and commercial actions with extreme precision, which results in a maximized impact and ROI. 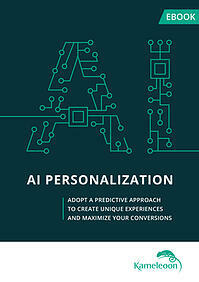 This ebook presents the situations when AI Personalization is a must, and illustrates these situations with many use cases from clients who are already multiplying their revenue and margins thanks to AI Personalization.